How to monitor your SQL Server instances..(4/10)? 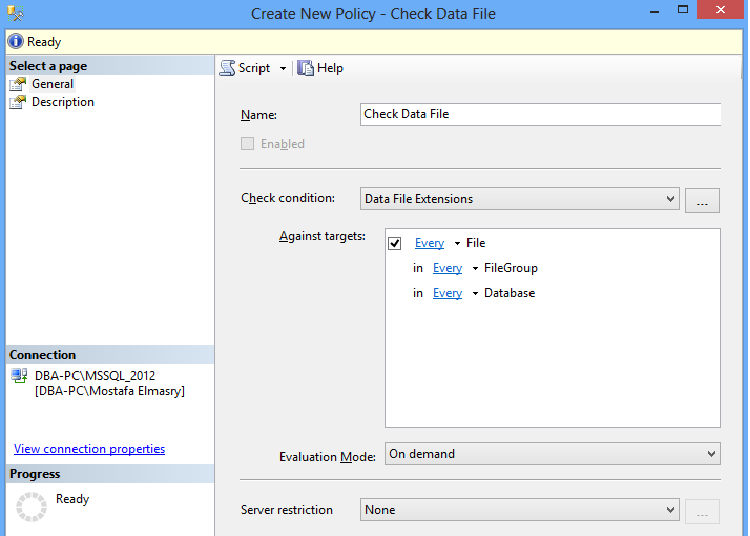 Check SQL Server jobs First Vision..? Check jobs Status ..? Is it enabled or Disabled ..? When was SQL agent job was created or when was last time it was modified..? Check enabled jobs Without notification setup ..? SQL Server Agent Job Setup and Configuration Information.. Check jobs With Enabled Schedule .. Check SQL Server Agent Job Schedule Information..
Configuring SQL Agent Jobs to Write to Windows Event Log. List by jobs are ruining now on your DB Server. Jobs With Execution Long Time . How to search on your Jobs TEXT. let’ s drill down to figure this 10 new point one by one . active_start_date : Start time for the job Execute. THEN '0' + CONVERT(VARCHAR(5), DATEDIFF(mi, ja. LEFT OUTER JOIN msdb.dbo.sysjobhistory AS jh ON ja. Check SQL Server Agent Job Schedule Information. How to monitor your SQL Server instances..(3/10)? in the previous Post i finished the Part of How to Diagnosis MSSQL Server or MSSQL Database with fast way..? but to be honest with you this really very big part and can’t Finished it coz this need much T-SQL , Professional Third party tool like dynatrace really wonderful Tool don’t miss any corn. 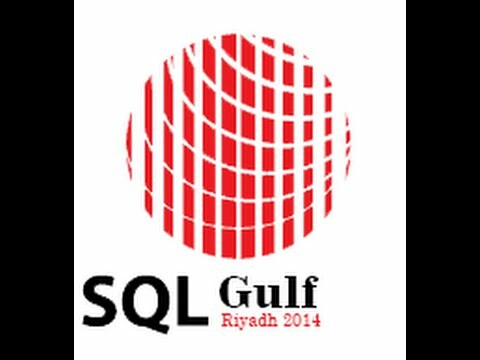 So today i will start new Part in our Series How to Administrate and Monitor SQL Server Jobs by T-SQL..? Job Name / Enabled or Disabled / Name of the scheduled/ Frequency of the schedule execution / Units for the freq_subday_interval/ active_start_date/ active_end_date/ Run_Time /Created_Date. When was a SQL Agent job was created or when was the last time it was modified? if you need to know this info the the date a SQL Agent job was created or the last time it was modified, you can find the information in the sysjobs table in the MSDB database. Jobs nightmare Really from past Experience this very Important point IF your jobs is enabled notification or no ? sure it must be YES Enabled to be know what happened in your Jobs to don’t see nightmare. Check Jobs without Schedule ..
Now after we determined what is the jobs have Schedule and what is no Actually we need to know the Schedule Information for each job. Follow Me to see my new posts and to complete with me this Amazing part How to Administrate and Monitor SQL Server Jobs by T-SQL..? How to monitor your SQL Server instances..(2/10)? How many databases are on the instance? What recovery models are they using? What is the log reuse wait description? How full are the transaction logs ? What compatibility level are they on? What is the Page Verify Option? Make sure auto_shrink and auto_close are not enabled! How to monitor your SQL Server instances..(1/10)? How to administrate DBs in a single click..? How to monitor your SQL Server instances..? Follow up SHEHAP EL-NAGAR to complete this wonderful and amazing series thanks for AMRO SELIM for his Constructive and fruitful collaboration in this Series . but this not the end because we will start very Wonderful and Impressive Series to complete our plan to help any DBA or DB Analyst in his/here job now you can mange your database and administrate it but How to monitor your SQL Server instances..? 1- How to Diagnosis MSSQL Server or MSSQL Database with fast way ..? 2- How to Administrate and Monitor SQL Server Agent by T-SQL..? 3- How to Administrate and Monitor SQL Server Backup and Restore by T-SQL..? 4- How to Audit your SQL Server instance and database ..? 5-How To Monitor your instance and Database by Using ( DMV , Alerts , UCP Moitor , Third party tools..Etc)..? How to Diagnosis MSSQL Server or MSSQL Database with fast way ..? I am not the owner for this Scripts only i do wide Search on the internet to Collect it Follow me in the Next post to know more Scripts About how we can Diagnose MSSQL Instance|Database. 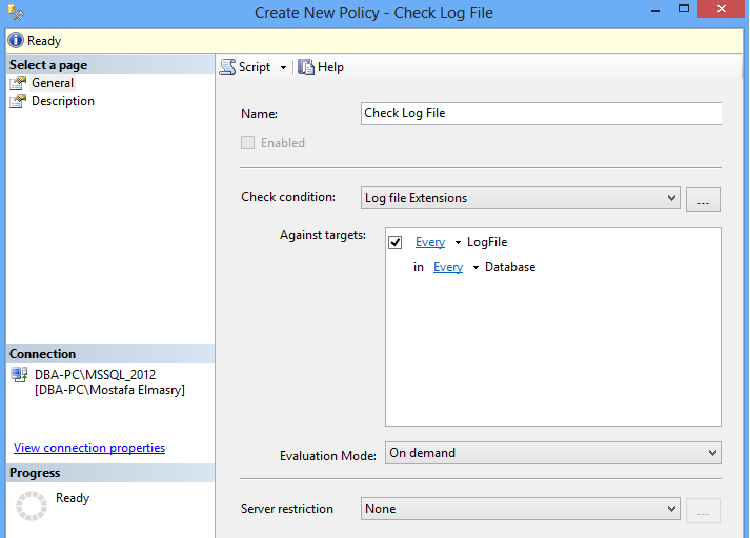 Today i will explain how to Check all Data file and log file for all your database we will check the Extensions for (MDF , NDF , LDF) by using policy management . 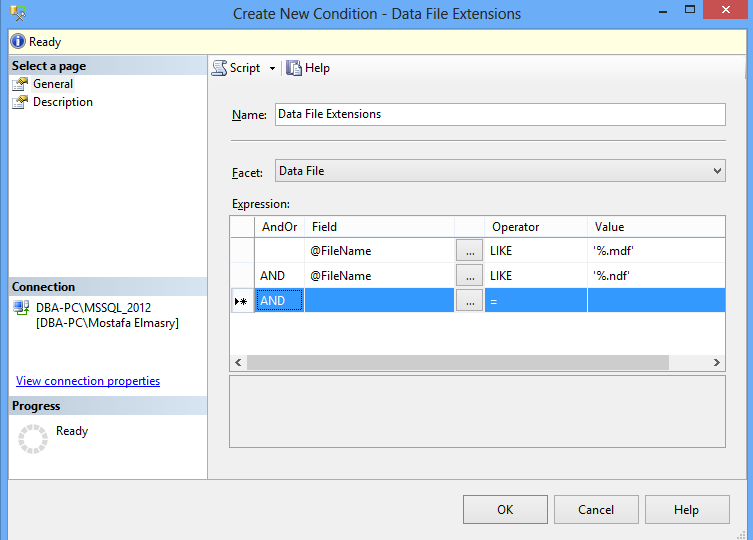 Name : Data File Extensions . Facet : Data File . 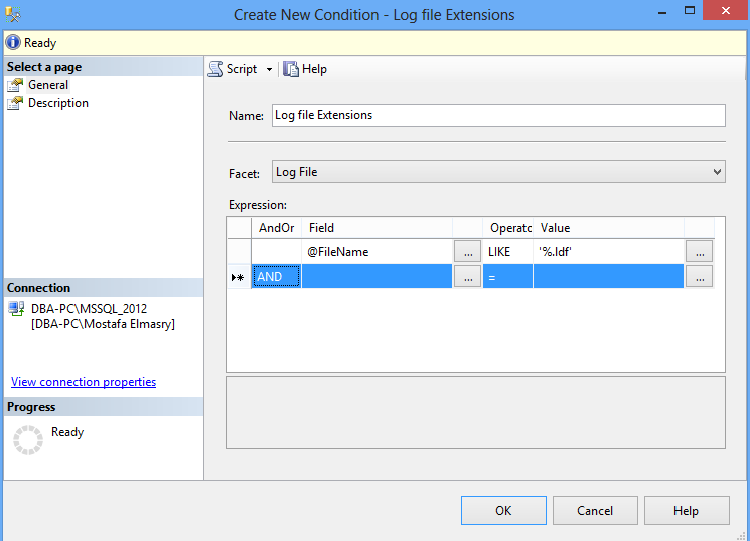 Name : Log File Extensions . Name : Check Data File . Name : Check Log File . 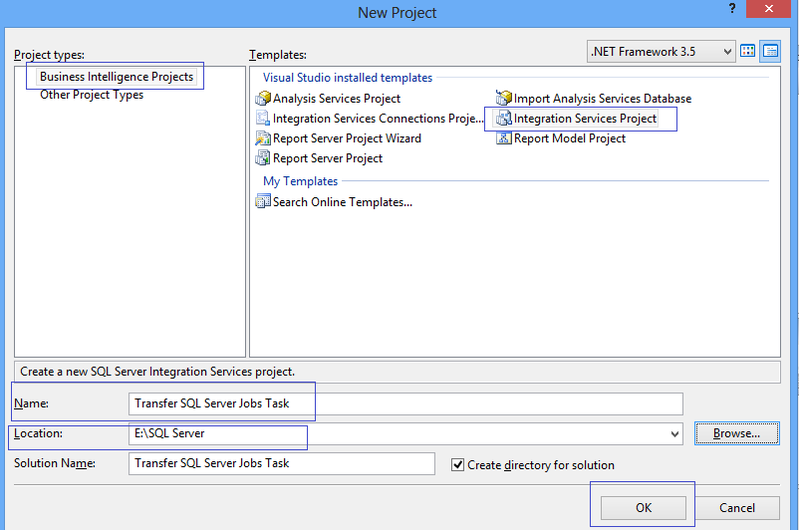 How to Transfer SQL Server Jobs Task from Source Server to Distention Server! How i can transfer SQL Server jobs Task from Source Server to Distention Server without T-SQL Script ? We can do that by SSIS ” SQL SERVER INTEGRATION SERVICES ” by creating new package on it to transfer the jobs task from one server to another server. 2- from the left Select from the Toolbox Menu under the Control flow items >>> Transfer job Task >>> Drag and Drop this task on Control flow page >>> right click on the task >>> Select Edit . 3- After the Edit we will view New Screen ” Transfer Jobs Task Editor ” >>> Select jobs from the left bar . Source Connection : The SQL Server Instance the Jobs Crated on it . Destination Connection : The SQL Server you need to referrer the jobs to it . Transfer All Jobs : False if you don’t need to transfer All jobs and this is Default Value , True if you need to transfer All jobs . Job List : if you select The transfer All jobs is FALSE Select from here the Jobs list you need to transfer it to another Server . FailTask : If the job Found Fail The task. Overwrite : if the job Found Overwrite on it . EnablejobsAtDistention : False = Disable , True = Enable . 4- now we need to run the task by F5 or Click on play icon to execute the package. 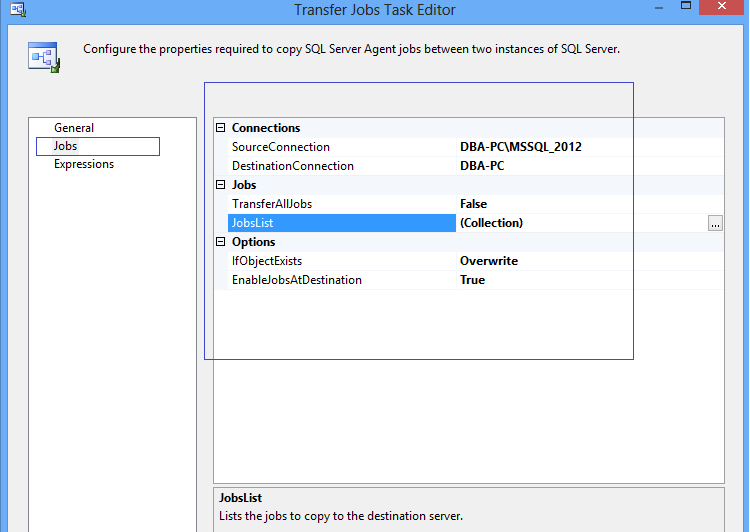 5- Now Check your Distinction SQL Server Agent Jobs you will found the New Jobs you Selected it to Transfer .